Step 1. 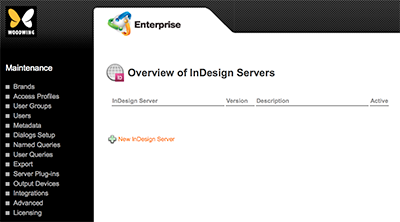 Access the Overview of InDesign Servers page in Enterprise Server. Step 1a. In the Maintenance menu, click Integrations. A page showing links to integrated services appears. Step 1b. Click InDesign Servers. Step 2. Remove any instances referring to previous versions of InDesign Server. Step 3. (Optional) Uninstall any previous versions of InDesign Server by following the instructions provided by Adobe.